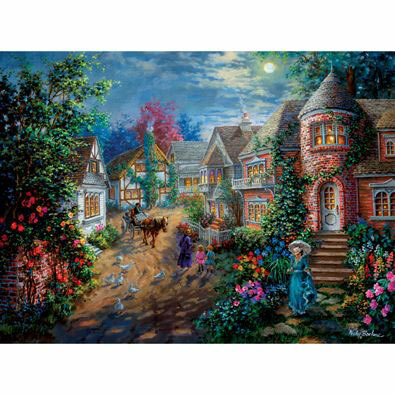 Moonlight Splendor is a 500 piece jigsaw puzzle designed by artist Nicky Boehme. A woman emerges from her brick home in ruffled blue dress, parasol and hat. Children stroll with their nanny returning home on a colorful moonlit night . Grazing The Fertile Farmland is a 500 piece jigsaw puzzle designed by artist Nicky Boehme. A farmer looks out from the door of the barn, while horses frolic in the paddock. Roosters and chickens roam freely on the floral covered landscape. Merriment is a 500 piece jigsaw puzzle designed by artist Nicky Boehme. Children are out for a summer wagon ride gathering flowers and enjoying ice cream. Geese waddle at the entry of the covered bridge as the wagon makes its way along the country road. Picturesque Covered Bridge is a 500 piece jigsaw puzzle designed by artist Nicky Boehme. An old wisteria tree in bloom grows on the side of the river next to the covered bridge built in 1873. A white steeple church welcomes visitors to the quiet hamlet on the other side of the gentle river. Available in two piece counts. Over The Bridge To Grandma's House is a 500 piece jigsaw puzzle designed by artist Nicky Boehme. A couple rides in their horse drawn sleigh on a sparkling winter evening. A great pine tree, the bridge and the stone house are decorated with holly and lights for the holidays.